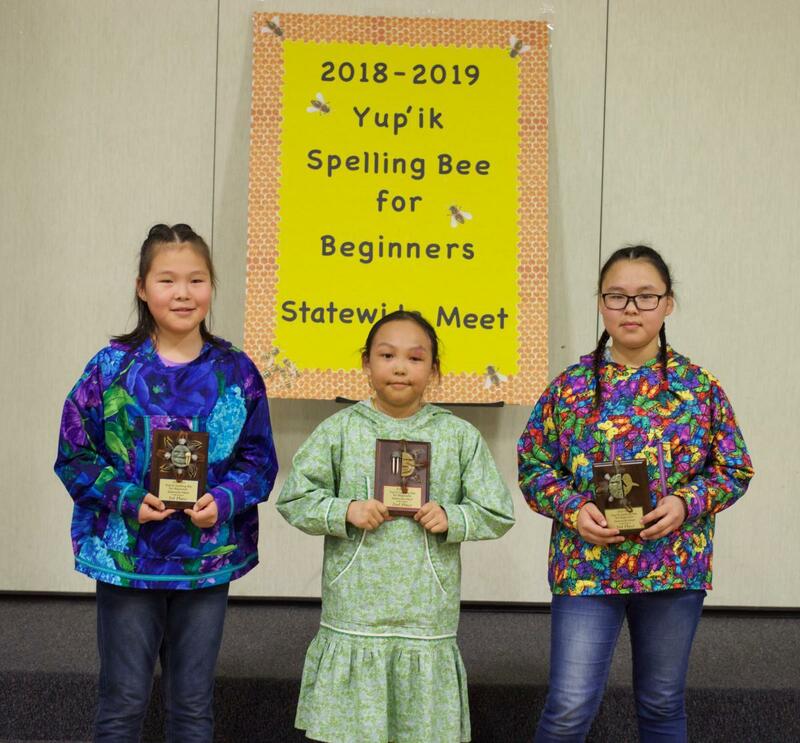 This weekend, the longest battle in its short history took place at the Statewide Yup’ik Spelling Bee for Beginners in Anchorage. Before it even began, the spelling bee looked like it might take a while, because there were more contestants than ever in the Yup’ik Spelling Bee for Beginners. But no one thought it would take four hours to narrow the field down to the winners. The 18 contestants began at 11 a.m. Saturday, and it was after 3 p.m. when the winners were announced. “This spelling bee covers all Yup’ik dialects,” organizers announced before the competition began. The first round was tough, but there were some who clearly had more expertise. During the first round, the judges agreed that they had a winner. Angniun Opriann Lomack, a sixth-grader from Akiachak, had spelled every word she had been given correctly. But that did not end the contest; there was a tie for second and third place to resolve among no less than six competitors. To earn her second place on the podium, Friday had to out-spell Richelle Phillip, the teasing cousin of the winner of this year’s Yup’ik Spelling Bee. Both cousins are sixth-graders at Akiachak School. The winner, Angniun Opriann Lomack, worried about one competitor more than any other. On the Yukon-Kuskowkwim Delta, Yup’ik dance has undergone a renaissance. Everything that goes along with it, from intricate beading, headdresses to mukluks, dance fans to masks, has a story. A bill that supports the revitalization of Native American languages has moved to the full U.S. Senate. The Alaska House of Representatives has a new special committee to focus on tribal affairs. The committee will aim to advance relationships with tribes. Lawmakers spent the first few meetings getting an overview of how tribes are governed and reach compacts with the state.